While GoPro supplies great footage it is often unusable without some sort of stabilization. Sometimes stabilization is made in post, with some cost in image quality, but we are seeing more and more options for stabilizing footage while shooting. This is what Aeon wants to do for your GoPro – “Create Smooth, Cinematic Videos“. The Aeon has some very nice features under the hood and a very slick design as a the hood itself. Think Halo meets District 9 kind of look. The Aeon is a 3-Axis gimbal so it provides all the stabilization you would expect from this kind of device (and the demo reel is quite impressive). But it also has some nice features to make it stand out. 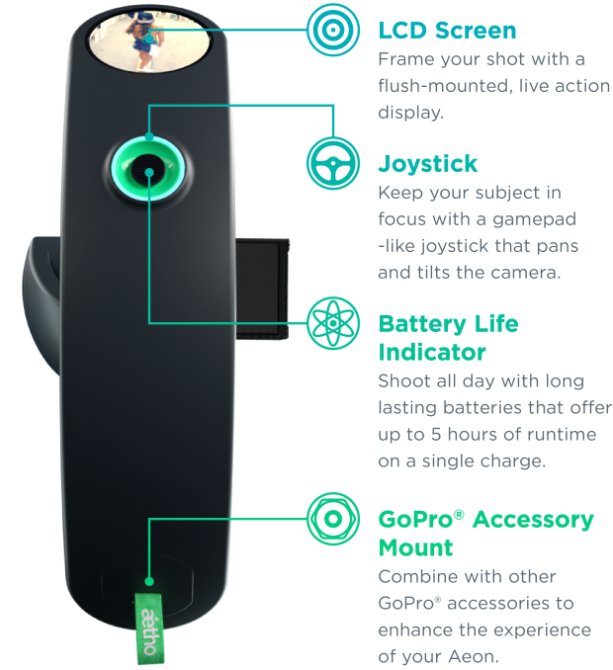 I think that the most interesting features is the small round embedded LCD on the handle that actually shows you some of what the GoPro is filming. IS using a small LCD that does not show the framing convenient? Time will tell. I have never tried it myself, but considering the most GoPro footage is wide lens and not carefully composed anyways I don’t think that the screen form factor is a big thing. Next there is a gamepad-like Joystick that allows you to pan and tilt the camera. (think MoVI second operator style). Aeon runs on Aeon takes two 18650 batteries and the company says it will last 5-6 hours on a single charge. But 18650 batteries are quite common so you can have few of those in your bag and practically run for an entire day without needing to charge. If you have a power source (like a bigger battery) in your pocket, you can use a power port to provide power to the GoPro so it lasts longer. Lastly, the Aeon features a GoPro mount and they are shipping a selfie stick with each unit so you can build some sort of a makeshift GoPro Jib. Weather that is something you’ll actually do, remains to be seen. As always, the value of these kind of devices is measured by the amount of stabilization they can provide, the first two images, are illustrations of how the gimbal works, and the video below it shows some real life test footage from the Aeon. this is the kind of thing that it’s best to wait for production before buying. Notice how they don’t show the thing being used in the action shots, and the shots of the device are all 3d models. Not even showing a prototype. They probably used a professional rig to get the action. Hey Boats, and Mike, thanks for your comments. I am Ian Nott, co-founder and CTO of Aetho. Our circular LCD display’s conversion electronics are finished and we are spinning up our custom PCBs as we speak. We pull the composite video from the GoPro’s mini USB port, and then use a color space conversion chip and FPGA to translate that video to the digital serial interface of the 1.38″ circular LCD. In terms of our crowdfunding video we shot most of it using Aeon. All shots are marked ‘Shot with Aeon’. You can also see many clips of it in action in this video, and across our social channels. As there are 25 or so test units being used at this point. We are really proud of the software tuning we’ve created to allow all shots to look this smooth without any post-stabilization. We raised a significant seed round at the beginning of 2015, which has allowed us to finish all of the mechanical and electrical design, and start the tooling process. This in parallel with the extensive user testing we’ve been running with some of the world’s top skateboarders. I hope you will take a fresh look at our campaign, and please feel free to ask any additional questions. Thanks for replying cordially to someone that is overwhelmingly negative like I am. The video on the campaign looks better than these ones, but I am still skeptical that the thing actually exists. However, unless I see another camera filming your screen doing it’s thing I am not going to believe it. I will say your video does look less less like a scam than most Indiegogo campaigns. But that really isn’t saying much. Indiegogo makes Kickstarter look legitimate. Also, FPGAs and Circular LCD panels are immediate red flags for me. Nobody uses FPGAs on consumer goods. And you never see Circular LCSs on mass produced devices. Hey Mike. FPGA’s are used in many of the consumer devices we all know and love. Everything from Macbooks, cable boxes, Google Glass, and much more. Circular LCDs are in wide mass production thanks to the success of smartwatches such as the Moto 360, Huawei Watch. There are many display manufactures who are focused heavily on circular LCD/OLED panels due to this explosion in demand. Indiegogo? Couldn’t even make it on to Kickstarter? Immediate red flags. Flexible funding on Indiegogo will give them the money even if they don’t make the funding goal. The scam rate on Indigogo with that funding model is about 10x what it is on Kickstarter.